Antenna and tower articles are in short supply right now because our winter weather is persisting rather than making way for spring. This keeps me more indoors than outside, with projects temporarily on hold. That will soon change. In the interim I thought the following would be of some interest. Contest plaques are not terribly compatible with mailboxes! Back at my city QTH plaques and parcels were left on the doorstep. 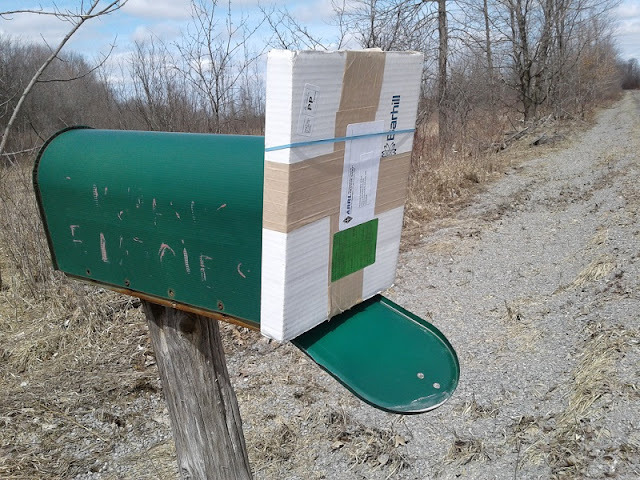 In this sparsely populated township the mail carrier never steps outside of her car so you get this sort of thing happening. At least it's better than receiving an invitation to drive 13 km to the local post office to pick up large packages, which happens often. The surprise mentioned above was not the delivery method but rather that I received a plaque for a contest that I have no recollection of winning. Opening the package I found that it is for 2017 ARRL DX CW in which I won Canada in the low power category. I then learned that my own club, Contest Club Ontario, is the sponsor. Since it is considered polite to thank the plaque sponsor I stood in front of a mirror and thanked my reflection. The plaque is my payback for buying raffle tickets to fund CCO. Unlike other plaques I've won that this one comes in kit form. ARRL has one standard plaque to which is affixed a plate bearing the particulars. The instructions require that I peel the adhesive protective cover on the back of the plate and carefully glue it into the blank rectangle at the lower right. This is worse than a kit that requires soldering since it is all too easy for the fumble fingered like me to incorrectly centre and align the plate. I doubt the plate could survive removal for a second attempt. I undertook the task and managed to do a not entirely unsatisfactory job. 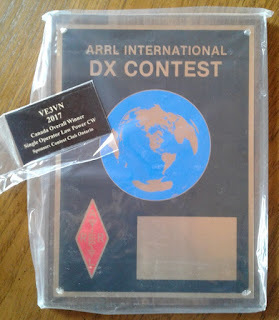 Although I'd rather ARRL took care of this detail themselves I appreciate the recognition for my contesting effort. Even if I did pay for the plaque by buying all of those raffle tickets over the past several years.